GLOBAL WARMING IN NETHERLANDS…….NOT – The Tundra Tabloids……. It’s getting cold again folks. But the scenes are not from a mountain village buried by a heavy snowstorm. 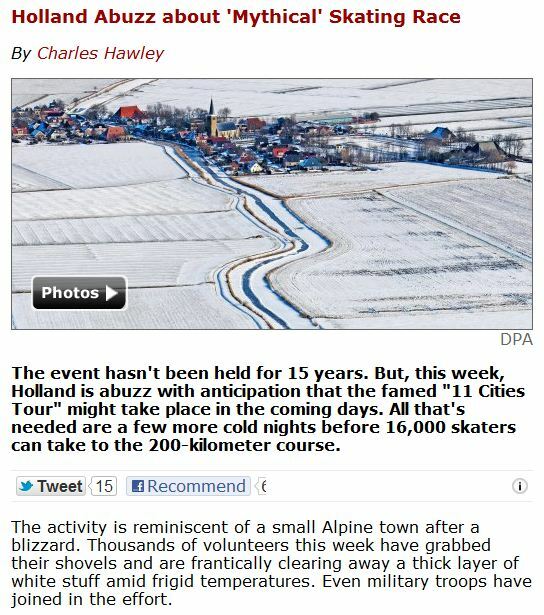 Rather, the massive army of helpers can be found in the Netherlands, where the entire nation is excitedly anticipating the prospect of a massive ice-skating event — and one that hasn’t been held for 15 years. Called the Elfstedentocht, or 11 Cities Tour, the event follows a course almost 200 kilometers (125 miles) long through the extensive network of canals, lakes and rivers in Friesland, the Dutch province in the very north of the tiny country, passing through 11 towns in the region. And it can only be held when the ice along the entire track reaches a thickness of 15 centimeters (six inches). With a frigid high pressure system having been parked over northern Europe for the last week, canals in Amsterdam, Utrecht and elsewhere in the country have been jammed with skaters, and some cafés in the capital have even set up tables and chairs on the frozen waterways. The national obsession with skating has only heightened the excitement about the possibility that the Elfstedentocht could once again be held. Previous Post Previous Post FINLAND: SOMALI LEAPS FROM 6TH STORY APT. WINDOW TO HIS DEATH IN ESCAPE FROM INTRUDER……..
Next Post Next Post GLOBAL WARMING EPIC FAIL: SNOW IN ALGERIA……. is is islam compliant, otherwise they’re stuffed. I can’t remember a time when it was so cold in the Netherlands. So much for global warming.